Riko opens her eyes to an upside down view of Reg’s face. 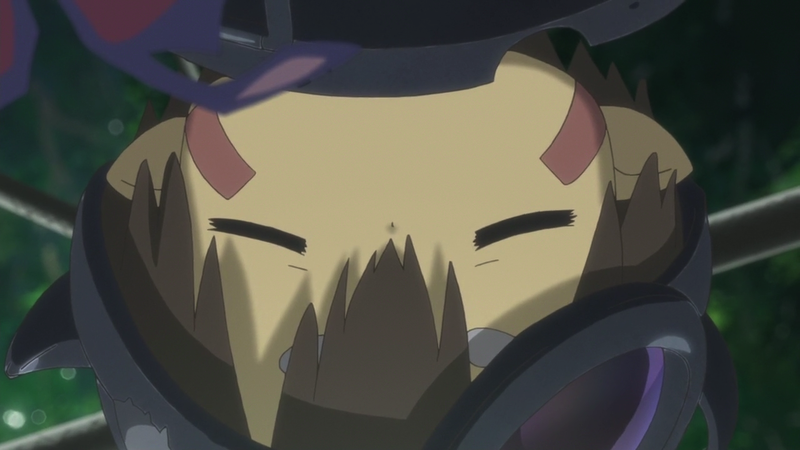 Even something as familiar to Riko as Reg’s face is inverted the first time she opens her eyes at the beginning of their journey. The fact that the above framing is thanks to Reg’s protectiveness does little to assuage the sense of foreboding that permeates the entirety of Episode 4. 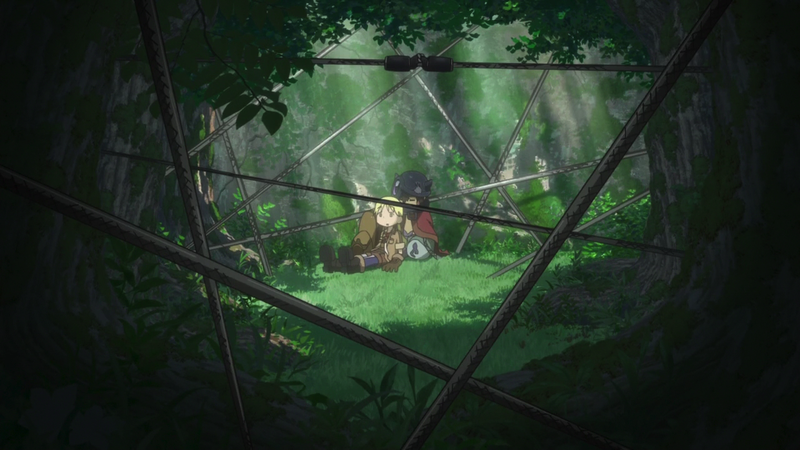 Although the two are surrounded by a safety net of sorts, the visual message is loud and clear: Riko and Reg are well past the first threshold and into the belly of the whale. 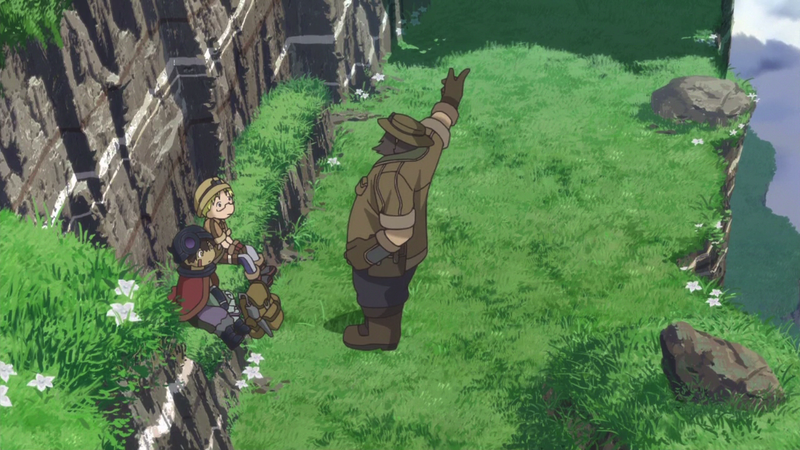 Using specific visual framing, Made in Abyss doesn’t let us forget that Riko and Reg are past the point of no return. 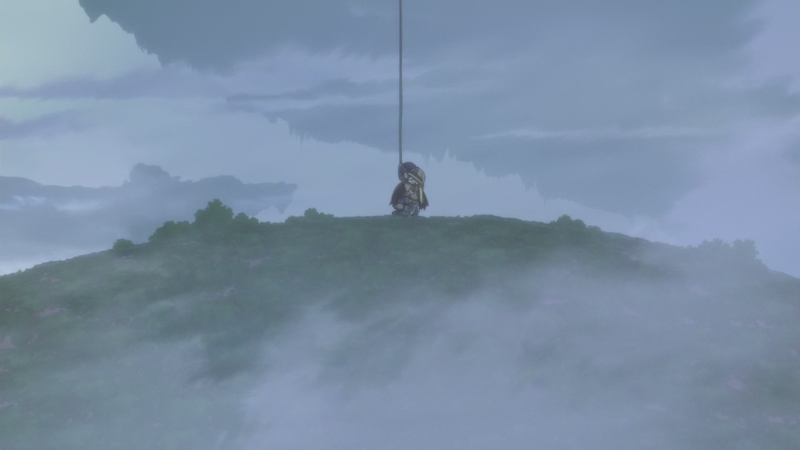 Made in Abyss is full of verticality, reminding us that Riko’s entire world has been shaped by the Abyss. This extends to a time long before Riko was even born, since her mother is a larger than life explorer of the Abyss whose actions have, in turn, helped shape their society. This is often reflected in overhead shots, or cinematic cuts that emphasize the depth and scope of the Abyss when compared to Riko herself. However, the latest episode takes these specific shots and deftly uses them to shift the tone of the series. Before, the cinematography focused on showing us how the Abyss looms as a backdrop of Riko and others’ everyday lives. Now that Riko and Reg have crossed that first threshold it takes a more voyeuristic approach. Something or someone is always watching. This is done by changing the positioning of the camera so everything seems just a bit off. 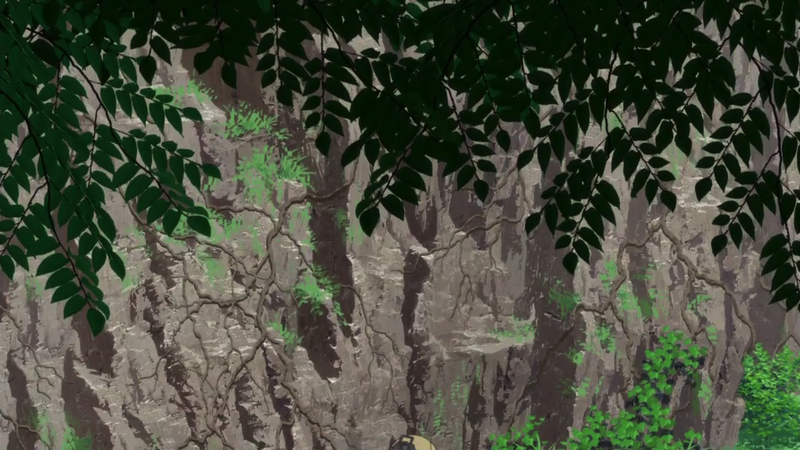 In the first shot above, the spider creature’s legs frame Riko and Reg in the foreground, while waterfalls frame them in the background. They’re trapped, with the spider about to attack. During their escape, they’re further framed in the second shot. 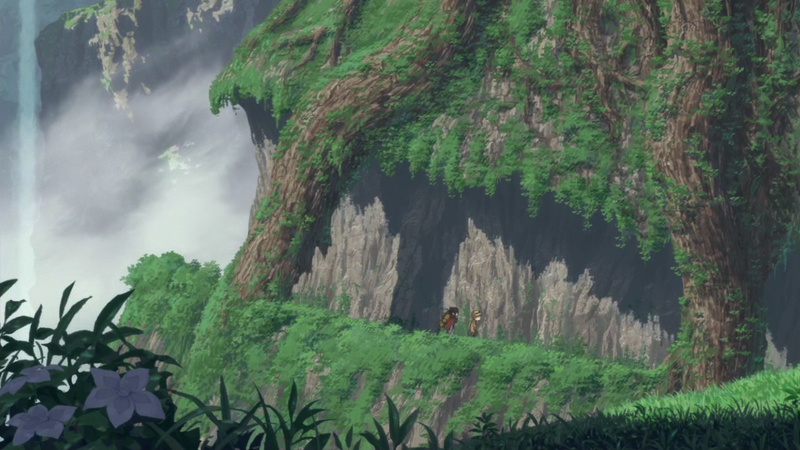 Trees serve to box them in against the side of the cliff while the overhang and shadows serve the same purpose as the waterfalls in the previous shot: Showing that Riko and Reg are still cornered even when out of the reach of immediate danger from the spider. 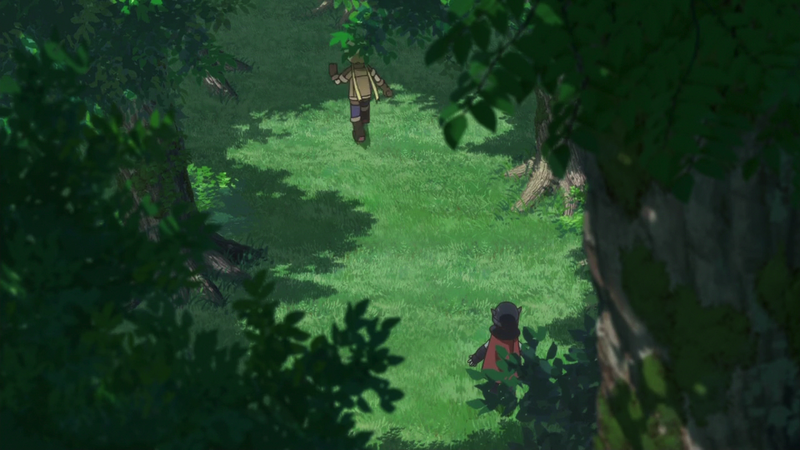 There is almost always something in the foreground or in the background, accentuating the depth of the shot but also that Riko and Reg are not alone. 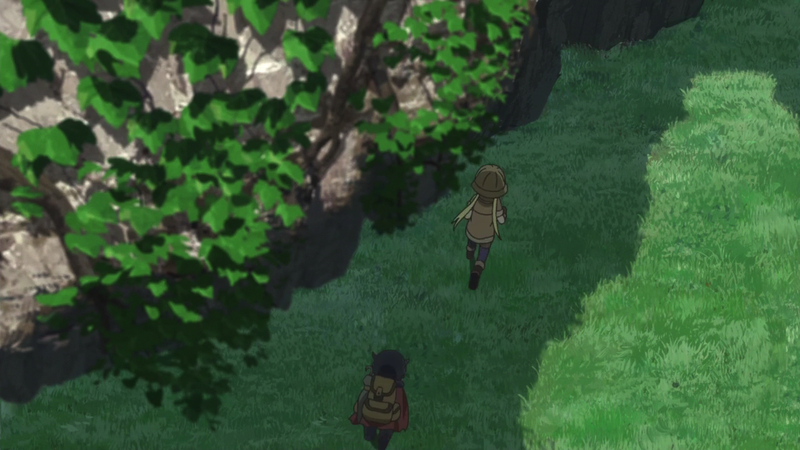 Whenever they are running away — even when they’re not in danger, the first scene is where Riko runs to the edge of the cliff in awe and excitement — the scene is shown from the perspective of someone else in voyeuristic fashion, giving scenes an eerie tone of foreboding. This is also emphasized by the manner in which the camera pans from top to bottom, even from an above angle, like the shots below. We are not the ones framing Riko and Reg in this manner. Instead, we are watching someone, or something, else watching them. One of these someones turns out to be Black Whistle Habo, who was sent by Riko’s friends on the surface to oversee her journey. Yet, his appearance isn’t necessarily a relief, since the camera doesn’t wholly stop these oddly intrusive shots. 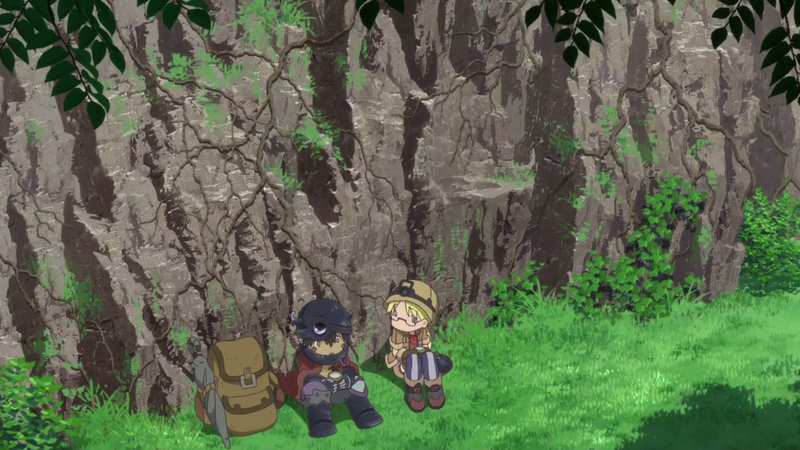 Instead Habo is included along with Riko and Reg. 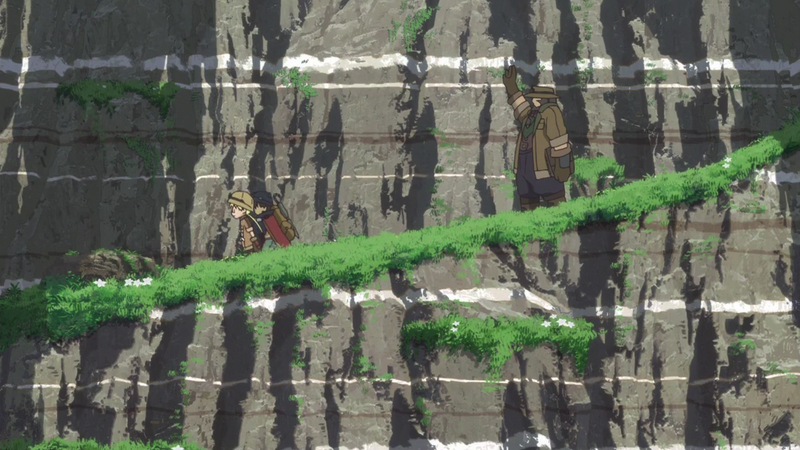 When he says his goodbyes, there’s an overwhelming sense of finality to them, aiding by horizontal, limestone-like stripes in the cliffs, showing Riko and Reg traveling deeper without the aid that has been offered to them. The slower pace of Episode 4 is purposeful. 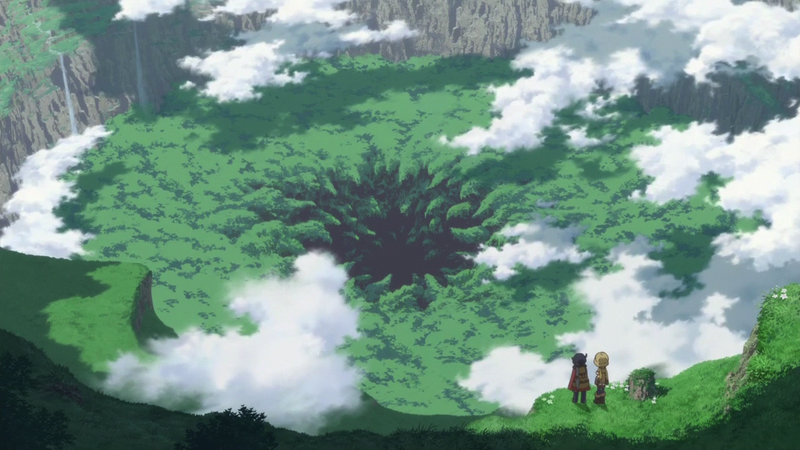 Yes, Riko and Reg are in the belly of the whale. They have passed the point of no return. 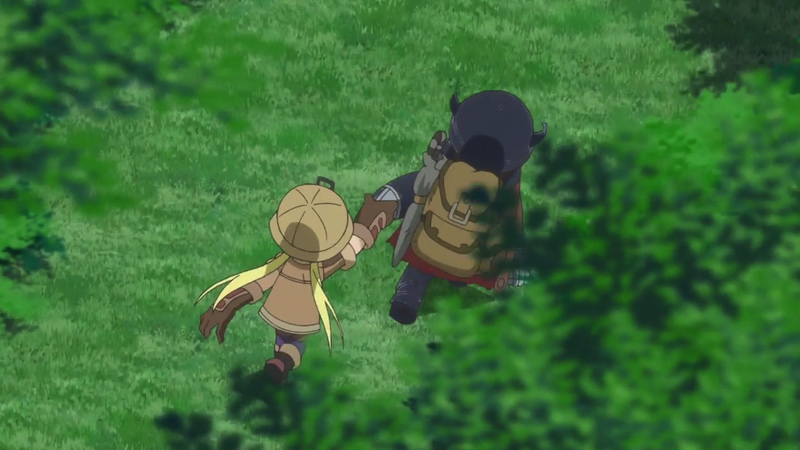 Lest we forget this, Riko and Reg are shown in a near mirror image of Shiggy’s textbook on the Curse of the Abyss when describing the varying effects of attempting the return from different levels. 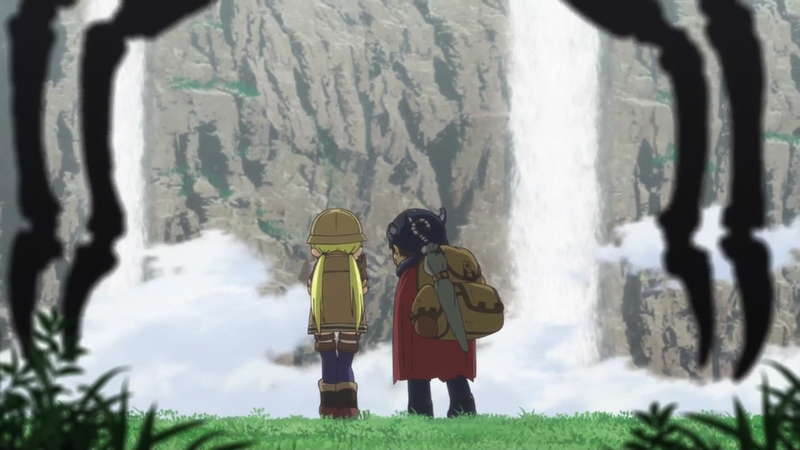 But the first threshold is a large one, and Made in Abyss visually muddies the two at times, reiterating the disparity in knowledge between Riko, those more experienced with the Abyss like Habo and her mother Lyza, and finally the viewing audience and Reg, who are discovering everything presumably for the first time (manga readers excluded). Riko knows a lot about the Abyss from her upbringing in comparison to us as viewers, but she also knows very little in comparison to someone like her mother, Habo, or even Leader. At the end of the episode, there’s another threshold to cross. 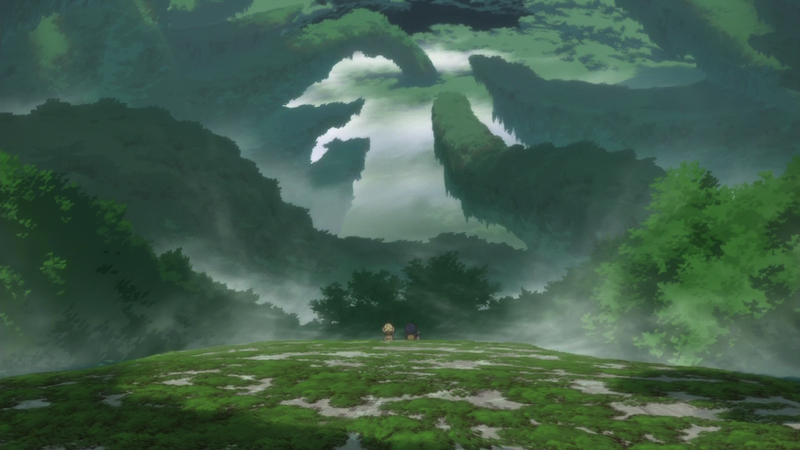 Riko and Reg disappear over a rare horizon towards the Forest of Temptation, a part of the Abyss with which Riko isn’t yet familiar. At this point, verticality is familiar to us as an audience. The use of a horizontal threshold is off-putting and eerie. Riko, and us alongside Riko, had travelled in the first layer, but never the second. As Reg reiterates, they’re now past the point where a search party would drag them back to the surface, the true belly of the whale. 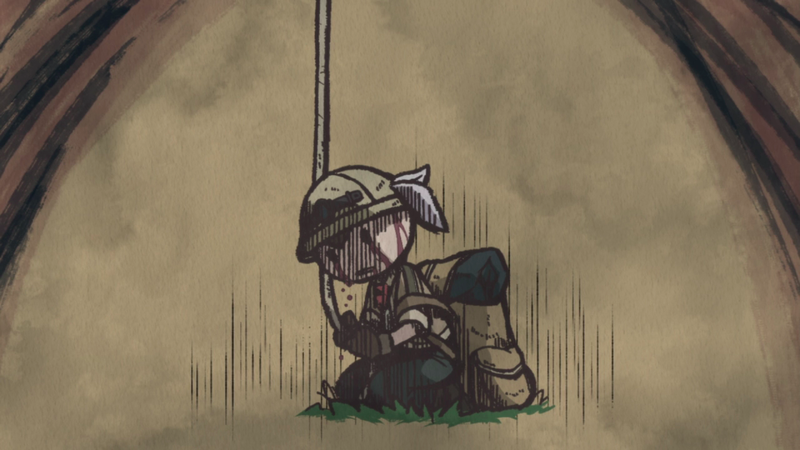 The direction in this anime is truly fantastic. So many unique angles and great framing techniques on show.